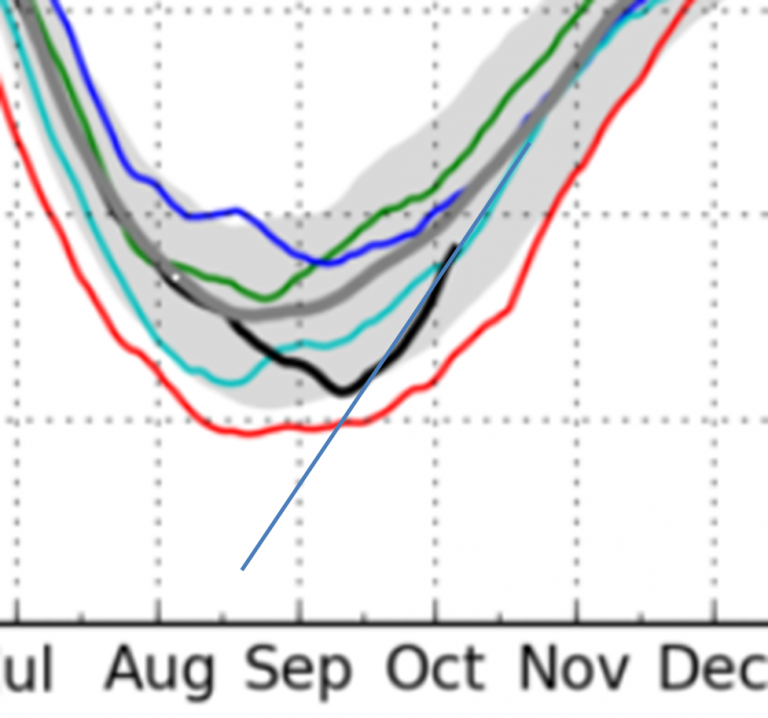 Extraordinary September Arctic Sea Ice Growth…Rate Of Increase As Strong As Typical November! Browse: Home / 2016 / October / 05 / Extraordinary September Arctic Sea Ice Growth…Rate Of Increase As Strong As Typical November! Contrary to what is often claimed, Arctic sea ice is not in a death spiral, and has been stable for the past 10 years. Volume is now well near normal level at over 9000 cubic kilometers. Sea ice area can be seen here. As shown the recent rate of growth is something that we commonly see in late October and in November. Usually the rate of growth is only about half as much. Using the global warming theory on Arctic sea ice extent, i.e. it’s due to temperature, this year’s impressive growth would tell us that the Arctic must have been unusually frigid over the past three weeks. But looking at the Arctic temperature above 80°N latitude here, we see that temperatures have in fact been well above average. So what’s going on? 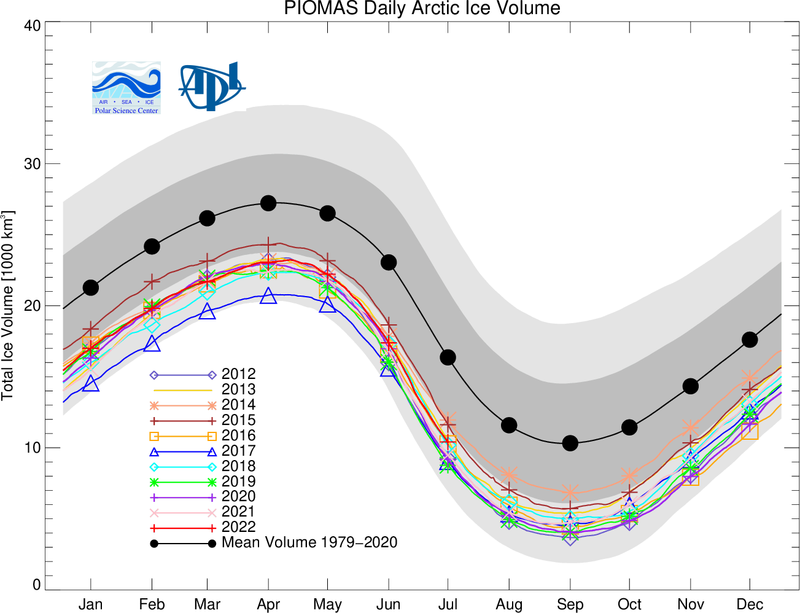 How can ice be forming so rapidly when it’s been mild over the past few weeks? What can we deduce from all this? It tells us that Arctic sea ice extent has a lot more to do with other factors other than surface temperature. Critical factors include, ocean currents and cycles, wind conditions from weather patterns, and so on. So the next time an alarmist tries to tell us that sea ice loss is proof of warming, then just point out that there’s a lot more to it than just surface temperature. This year shows that in a very profound way. The system is far more complex than just a trace gas (one, by the way, that happens to be a convenient vehicle to mass regulation). It was a try to reach record low buy classifying broken ice as open water. Another home run PG. Bravo, bravo, bravo. If sod dares come here I am going to clobber him with relish. Clobber him with relish ?! ? By not opening the jar first. Even with all the warmunist “arguments” sog’s mustard, he’ll never ketchup…to the truth. If I’d known my comment was going to lead to that I’d have never made it. Good one, LOL. PIOMAS data shows 2 SD below the mean..
Can anyone explain the the disparity?